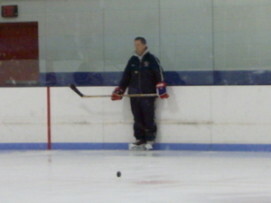 Yesterday, I got to sit down with former English Department head and current Golf/Hockey coach Bob Conceison. This school year is his first year retired from teaching but he continues to Coach some of Burlington's best athletes, whether it be on the course or on the ice. 1.) As we know, this your first year retired from teaching. Has it helped by having more time to prepare for the golf and hockey seasons respectively? Not really. I do feel that I am a "full time" coach at times. But in reality, I miss the daily interaction with my players and all the students at BHS. 2.) This year, the Golf Team won the League Championship. How do you think the season went looking back on it? We had a GREAT season. Our better players really came through and our rookie players really improved and created a healthy team competition. I truly believe that our "in team" competition set the stage for such a great season. 3.) Next year you lose half the team (8 Seniors), How do you guys think you'll look next year? Do you think you'll achieve the same success as this years team? It all depends on off season work... On the course, at the range, getting some instruction and competing in tournaments. We have the potential both in returning players and others who did not make the team this year. Everyone needs to work hard to improve his game... Including me! 4.) Do you think the team will be ready for next years tough league schedule? Again, only time will tell. If everyone improves as much as BCody (Brendan Cody) did this year, we will be fine. 5.) So moving on from Golf, how's the hockey team looking so far? Strong. We have depth. We can skate. And so far, we can compete with the big guys! However, we need to develop more consistency in our game in order to be really good. 6.) You guys have won the first 3 games so far. Do you think that this is a good sign for big things to come? No question. We are off to a really strong start. But if you are running a marathon, and you sprint at the beginning, you won't make it to the finish line. We need to play in the present and not get too ahead of ourselves. 7.) Looking forward a bit, how do you think the season will go? Do you believe the Middlesex League Championship is in sight? Like number 6 above, we have the ability. But, in order to achieve our goals and that is one of them, we need to develop a confident consistency in our play. 8.) As a two-sport coach, what are your coaching strategies for each sport respectively? The sports I coach are so different. But in both, I concentrate on motivation, since I believe that the mental part of any sport is so important. Also, you cannot win if you are not a "team" in the truest sense of the word. 9.) Now the million dollar question... What sport is your favorite sport to coach? Golf or Hockey? I enjoy them both. I enjoy the difference between the two. The atmospheres are totally the opposite. I like the diversity. Personally, I am a recreational golfer not a competitive one. Golf is my sport of relaxation; Hockey is my sport of passion.